When people ask how I can afford to eat out I always tell them the same thing. Restaurant coupons help you save money on dining out. Once you get the hang of where to look it gets to be almost second nature. Not only are a few bucks saved but it helps me find new places to eat. Since it seems like I'm forever meeting colleagues it's nice to try a new restaurant now and then. Here are a few places where you can find restaurant coupons. I don't use a coupon every time but I'm working on it. Did you know that gas stations and convenience stores often have restaurant coupons? Who would think that you can pay for gas and pick up a coupon booklet at the same time? These free newsprint booklets are small enough to overlook but they can pack big savings. Plus, they have other coupons that can mean additional savings. Knox County School Coupon Books are probably my favorites. They're $10 each but more than $7 goes to benefit the school system. One converstation with a teacher will confirm that the schools need the money. They are great to help you save in all kinds of ways. Restaurant.com offers gift certificates for restaurants at a deep discount. They have an A+ BBB rating and back up every one of the coupons that they sell. I've been able to get $25 gift certificates for $10 at some great places to eat. Half Off Depot is one of my favorite places to check for restaurant coupons (called vouchers here). So far I've dined at Brixx, Petro's Chili and Chips and Long's Drug Store for half price. How's that for cool? They're linked on this page so it's easy for you to check them out. Yes, I do get around 10% every time you purchase from this link. But, I've used them longer than I've promoted them and haven't been disappointed yet. Check the online websites for the companies you love the most. 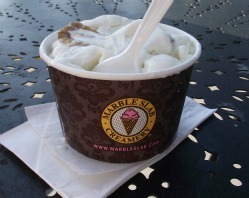 You may have to sign up for an email club to get the restaurant coupons, birthday ice cream from Marble Slab Creamery. I've gotten a free biscuit from Bojangles, a free Birthday burger and BOGO coupons at Ruby Tuesday and appetizers from Chili's and Texas Roadhouse plus others. If you like a restaurant it's worth signing up for the coupons. When I can pick up a newspaper I try to check there for coupons. It's hit or miss but sometimes you can get some great savings. Where do you find your restaurant coupons? Leave a comment to below to let us know. Don't forget to the page 'like', 'cool' or give us rating. This lets us know how we're doing.